Stuff You're Gonna Love | House Unseen. Life Unscripted. In case you haven't noticed, I get excited about things. In real life I hop around and do happy Wallace & Grommit hands about all sorts of things. You know, like homemade salsa and a $6.99 bread machine from the thrift store. Do you wanna know what I'm doing happy Wallace & Grommit hands about right now? But maybe I'm getting a little ahead of myself. Remember when I did that Webby Wednesday feature of the Magnetic Catholic Etsy shop? Well, the fabulously talented Melissa has expanded her awesomeness and now has her unique and wonderful art available on Zazzle.com. A St. Francis shirt for your dog! A St. Cecilia coffee mug! St. Joan of Arc iphone case! First communion gifts! Mothers' day gifts! Happy Friday gifts! Seriously, just click here . It'll be your best. day. EVAH. Wallace & Grommit Hands! I love it! 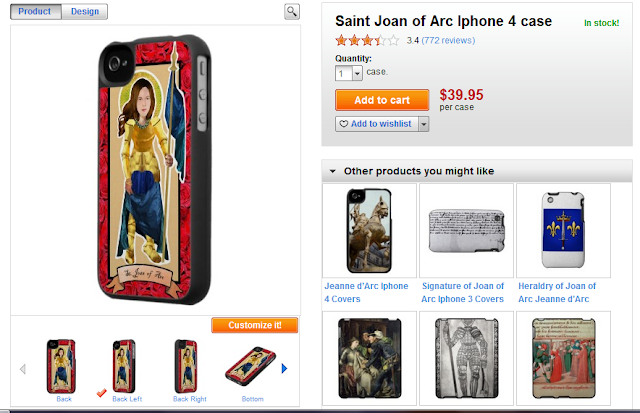 You know, I don't HAVE an iphone (or even fully understand what one is), and I want that St. Joan of Arc cover! Oh my gosh. iphone covers? Shut. Up. Sooooooooo getting one next payday! These are great! Way to go, Magnetic Catholic, how exciting for you, Melissa! I love her stuff!! Can she get on the ball and make some droid phone covers please? Pretty please?? 58 days until baby is here! Wow!